One Day in the Life of Ivan Denisovich (1970) was a gritty, sub-zero film featuring Tom Courtenay, based on the book of the same name by Alexander Solzhenitsyn. The author was writing from his own experience, and in spite of the horrendous conditions in the gulag where he spent four years (and was diagnosed with cancer), he went on to exile and eventual freedom, and died some 50 years later at the venerable age of 89. Before experiencing this truly underground performance, I first met Ken at the home of Matthew Meyer, who was then a Swiss film student, and is now known as Oliver Matthias Meyer, a maker of fascinating and socially conscious film documentaries. Matthew had contacted me with regard to making music for his first experimental short (which remains untitled, but I remember that it mainly featured close-ups of the unusually large Marty Feldman-type eyes of a young female friend of his). Of course, Matthew was skint so there was no fee involved, but I recall several evenings of feasting and jollity in his apartment which were ample recompense. During these tipsy suppers, Ken would often drop by and on occasion be suddenly moved to stand up and recite, gravely, in the style of a politician, the lyrics of a song such as “Respect” (Otis Redding) or “Be-Bop-A-Lula” (Gene Vincent). It was all the more hilarious because Ken would invariably be dressed in the formal manner which you see in the photo above; he never so much as loosened his tie. Apparently he had been dryly performing such recitations at Speakers’ Corner, much to the bewilderment of passers-by who, while used to vociferous nutters grabbing their few seconds of public attention, or more committed speakers with something of real value to say, could not for the life of them figure out exactly what this quiet, genial but absolutely poker-faced Aussie was getting at. I eventually acquired a cassette tape of his recitations, which had me and my friends in stitches for years to come. Sadly it is now gone forever. Ken’s sombre surrealist personality puts me in mind of René Magritte, who always dressed like a businessman, and one day decided to perform a Dada act for no other audience than his victim. According to (Miniatures artiste) George Melly, Magritte was once visited by a smartly dressed salesman, and when the hapless fellow bent down to take a sample out of his suitcase, Magritte gave him a severe kick up the backside. The poor man was so stunned by this unprovoked attack that he could not react, simply continued as if nothing had happened, and went on with his sales patter, while Magritte too retained a calm composure until the vendor left (doubtless with his brains thoroughly scrambled). Melly described Magritte as “a secret agent; his object is to bring into disrepute the whole apparatus of bourgeois reality. Like all saboteurs he avoids detection by dressing and behaving like everybody else.” This description could aptly be applied to Ken and his activities, although I am sure he never displayed the cruelty of which the Belgian master painter was apparently capable. But Ken did delight in gently playing havoc with our notions of normality, and after some time I eventually got to see him in action, on the tube. About ten of us met him at the agreed time on the agreed platform, and handed over our shiny 50p coins – the UK had just gone decimal, so the entire populations minds had already been weakened by having to deal with difficult conversions every time we made a purchase. 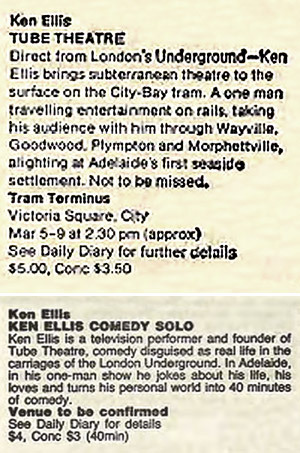 We were ripe to be victims of Ken’s surrealist japes. What followed wasn’t what you would call hilarious, at least in the normal guffawing sense of British comedy. Anyway, we who were in the know had to suppress our giggles in order to allow Ken to mess with the minds of our innocent fellow travellers; his bizarre behaviour was in utter contrast to his completely conventional look as a city businessman, complete with black umbrella. He didn’t go so far as to wear a bowler, but definitely had the look of one of Magritte’s cypher-like bourgeois gentlemen. Before boarding the train, Ken had already started his performance by standing precipitously on the edge of the platform, his feet half over the edge, straining left and right to see if a train was coming. Skilfully, he almost overbalanced several times, and one could hear quick inbreaths from some of the worried commuters. This being Britain, there was a long wait until the next train, so he had plenty of time to milk the gag to the max. On the last wobble, even we were tempted to dash forward and save him, but in the nick of time he lunged forward his rolled umbrella and balanced himself on it – the tip of the umbrella now lodged in the dark abyss next to the nearest rail. Now bent completely double, he stayed there for several endless teetering moments, straightened himself up just as the headlights of the train came out of the tunnel, and resumed his nonchalant businessman stance. Phew! On boarding the train there were just enough empty seats in the carriage for us to sit, slightly scattered but able to see Ken, with a good sprinkling of victims sat closer to him. At first he didn’t sit, but executed several skillful moves with the most obvious prop – the handles hanging from the rail that ran along the top of the carriage. Allowing himself to be buffeted and swung around by the turbulent motion of the ancient London tube train, he variously ended up with one or both arms yanked round the back of his neck, one or both feet off the floor, and of course the umbrella nicely entangled with his gangly body and or one or more of the handles. Three stations went by for this gag. The next obvious prop was a newspaper, which in the course of reading he succeeded in tearing in half, completely rearranging the pages, and eventually transforming it into a large pile of garbage at his feet. All done with his unchanging, Buster Keaton-ish poker face. Four stations’ worth of muffled giggles. The grand finale of Tube Theatre involved his tie. 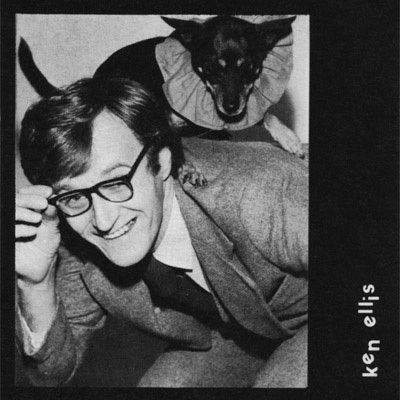 After tidying up the pile of ripped newspaper into his old leather briefcase, Ken turned his attention to his tie. It was of course a thin black tie, leading one to assume that he worked in the City or was on his way to a funeral (the latter being more likely considering the sombreness of his unchanging face). He looked down at the tie and started slightly on noticing that the narrow end was longer than the wide end. He then proceeded to execute a series of complex re-ties of the tie, each ending with either the narrow end still longer, the wide end far too long, or both ends over one ear or behind his neck. This was slow-motion clowning prowess on a par with Jacques Tati. After five stations of this, he allowed his face to break into a loud sigh, then smartly reached into his pocket, produced a large pair of scissors, snipped off six inches of the still-overlong narrow end, and sat back with a beatific grin. Tube Theatre was over and we finally allowed ourselves a hearty round of laughter and applause while, Candid Camera style, the surrounding victims smiled as they realised they’d been had. Not long after that, Ken found himself in the vast surroundings of my bedsit studio and we rapidly put together his miniaturisation of the Solzhenitsyn classic, backed by whooshing wind sounds created on my trusty EMS VCS3 “Putney” synthesizer, plus chisel sounds from a table knife and at the end, three beeps recorded from the telephone Speaking Clock (which by the way turned 75 years old last July). Ken is off my radar, these days. However, last week I spotted a page on Facebook that listed both his name and Tube Theatre, in regard to a social service called “Speak Up”, where people having difficulty dealing with a bullying boss or aggressive salesperson can role-play the situation with an actor or actors (possibly including Ken?) playing the part of the ‘orrible person(s) concerned. This gives the plaintiff the courage to then go back to the real world and deal with the problem. Nice idea, and very Ken-like in both its compassion and humour. I wrote a message on that page, but so far neither Ken nor anyone else has contacted me. Are you there, oh great Tube Thespian? Are you there, oh great reciter of rock and soul epic poems? Come out, come out, wherever you are, mate!